I moved to California when I was a wee 3-months old. I began school immediately. Yep, that’s right! A week after coming here from Oregon, I began Puppy Awareness classes at Jump Start Dog Sports in Yorba Linda with Aunt Debbie. Sam, my new Golden Retriever boyfriend, and I began classes together. The Puppy Awareness class is a short, month-long class for the first-time dog. Think of it as puppy pre-school. The Puppy Awareness classes were great fun. We learned socialization—learning how to get along with others (dogs AND people). We also started learning courage when encountering new things. Another thing we got to do was try out some puppy/beginner's agility equipment! I bet this is what got me interested in agility…Puppies should not begin agility training at the age of 3-months. Bones and muscles are not yet developed and injury can result. The equipment we used was designed more to help youngsters develop confidence. Why go to Puppy Awareness (Puppy Pre-School) and Puppy Kindergarten? One of the most important reasons to take a puppy to school early on is to help develop socialization skills. This is similar to the reason you would take a human child to pre-school! The earlier you can get your dog (and human) into a puppy awareness/pre-school, the better for EVERYONE. Socialization is just one of the keys to having a happy and well-behaved pet. Dogs who were socialized later in life often have behaviour problems that are more difficult to correct so getting PUPPIES to school early may help reduce potential problems early on. Lessons include play time with other puppies as well as time learning to become familiar with 'equipment' such as stairs and ramps, things that are often found in the home. Classes are fun for everyone, as evidenced by the happy smile on MY face! Next up, after the four weeks of pre-school, both Sam and I headed of to Kindergarten where we began our formal obedience training with renowned dog trainer Sue Myles. Auntie Sue uses a very effective force-free training, utilizing pawsitive reinforcement, love, and most importantly, no choke chain (I wore a Buddy Belt harness/collar for training). Auntie Sue's Kindergarten is amazing…and there is simply NOTHING that can possibly describe what a powerful experience and just HOW MUCH I learned in the short time I was in Kinder…Mama was a Kindergarten teacher (of human children) and she can relate to the growth I made! Woo-hoo! Oh, and yeah, Sam and I both graduated without ever peeing on the teacher. Some of the Kindergarten lessons included learning to sit, come when called, run TO MAMA/DADDY, not running out the front door…So, is it important to get to school EARLY? You betcha! If you can get your puppy to school BEFORE he/she is five months old, then it is a super-duper idea to do so. I recommend, without any reservations, the Puppy Awareness through Jump Start and definitely Auntie Sue's Puppy Kindergarten. After Puppy Kindergarten I continued my education because, after all, the more schooling you get, the better, right? (mama is a teacher so what did you expect?) I began Auntie Sue's Basic Obedience class. Of course, Sam was in classes with me (yeah, yeah…we got into some trouble so let this be a lesson. Don't sit WITH your friends in school. It's okay to be in classes together but sit far away from your friends or you can get in trouble with the teacher!). Basic Obedience continued on where Kindergarten left off and I learned how to work OFF the leash and learned how to listen really well to mama's commands. In fact, I learned to follow hand signals along with the voice commands. My lessons included homework (practice, makes for a pawfect companion!). I had so much fun that when Auntie Sue offered a class in being a Therapy Dog, I jumped right in! Therapy Dog training incorporated basic obedience and the various requirements necessary in passing the American Kennel Club's Canine Good Citizen test. This is a test that provides you with a special certificate. Auntie Sue incorporated additional lessons that she felt were important for therapy dogs like being able to fetch and pick up things that a person may drop. Since Shih Tzus are notorious for not wanting to fetch, this was a difficult task for me. It took some time but I can now differentiate and fetch and pick up items if you point them out to me! Needless to say, I passed my A.K.C. Canine Good Citizen test before I even turned 2-years old. I then went on to the next step which is to become certified by Therapy Dogs, International. Their test is much more rigorous. I passed it as well. I am a registered Therapy Dog. As mama, who is a classroom teacher of humans always says, “Going to school is cool.” I totally agree! It is pawsome! Agility Training here I come! Remember when I was a mere pup and I tried some of the agility contact equipment? Well, I actually attended a special seminar with renowned trainer Jen Pinder when I was just six months old. That gave me a bit of a taste of the fun involved in agility. After watching a number of real trials, and going through a lot of obedience classes, mama decided it was time for me to begin my training. I attended classes through a group called Intelligent Agility. I met Erin and Kevin when I was a wee pup cuz they worked with Auntie Sue. I started out with their Beginning Agility class and continued with the Intermediate and Advanced Agility. I absolutely LOVE agility! I was included in the Orange County Register (online edition) showing off my skills at a pet event in Lake Forest, California. Yes, there's just no stopping me now! 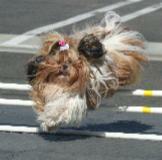 Check out some of my action shots on my agility page. 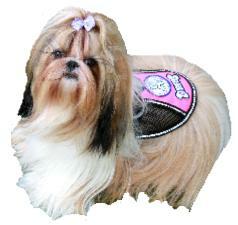 Note: Shih Tzus are considered very difficult to train. After all, why should we do what someone TELLS us to do? Hmmm? The fact that Auntie Sue was able to train me so well totally impressed my daddy (who has lived with several Shih Tzus so he knows how obstreperous we are). So, if you wanna go to school, go see Auntie Sue and learn from the bestest and tell her Chelsea sent you. OH, and if you are like me and keep on going, ask for the Awesome-Pawsome Deal, named for yours truly!